Elysia viridis. This juvenile, about 1 cm long, already is equipped with chloroplasts. Picture: Marc Cochu, Nature 22: Gastéropodes 4. Nature is full of interesting phenomena, in which animals acquire characters of their prey. So there are numerous sea slug species that transport their prey's cnidocytes (nettle cells) into their dorsal appendages to use them for their own defence. What animals generally cannot do is to perform photosynthesis, an ability that basically and by definition is restricted to plants. Photosynthesis usually happens with the help of special cellular organelles, the chloroplasts, in which carbon dioxide (CO2) is used up and Oxygen (O2) and glucose are produced. The oxygen is released into the atmosphere (which is why our atmosphere consists of 21% oxygen and makes earth inhabitable for us), the glucose is used to nourish the cells. As already mentioned, animals do not have this ability, which is why they have to either eat plants, or other animals that do to acquire nutrients. Some animal species solve the problem by using symbiotic algae, so called zooxanthelles, which also produce nutrients. Those for example are found in giant clams' (Tridacnidae) mantle cells. 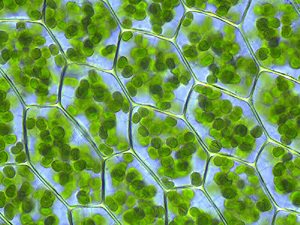 Chloroplasts from a leaf of the moss Plagiomnium affine. 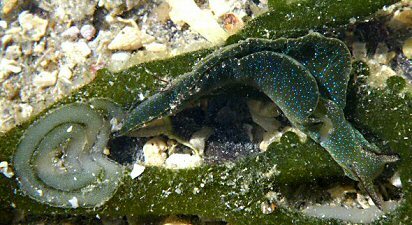 Another strategy is shown by the sea slugs of the genus Elysia. Elysia is not a nettle cell collecting nudibranch, but among the opisthobranchs it belongs to a group called the sacoglossans. Those mainly feed by puncturing plant cells and sucking the cellular liquid from them. The astonishing thing is: Elysia is as green as its food! When it feeds on plant cells, it also acquires the plant cell's chloroplasts and uses them in its own organism. It incorporates the chloroplasts in its intestinal appendages and uses the photosynthesis to win additional nutrients. This phenomenon is called cleptoplasty. Of course Elysia, being an animal, is not able to produce the chloroplasts on its own, it has to acquire them from a plant cell: The species Elysia chlorotica for example lives along the Northern East coast of the USA and there feeds on marine algae (Vaucheria litorea), from which it acquires chloroplasts. The juveniles not yet equipped with chloroplasts are brownish with red spots. Two movies about Elysia chlorotica. Left: A juvenile acquiring its first chloroplasts. Right: An adult feeding. Source: YouTube.com. In the North Eastern Atlantic, from Norway to the Mediterranean, lives another Elysia, Elysia viridis. This relative of the American species collects chloroplasts in a similar manner – only it feeds on another species of algae - Codium fragile. Elysia viridis during oviposition. Picture: Florence Gully, Nature 22: Gastéropodes 4. The gastropods may not be able to produce chloroplasts, but neither do they have to replenish them: They are able to maintain chloroplasts, which come from a totally different organism and not even fit into an animal cell from their construction, in their cells in such a fashion that not only the chloroplasts' function, but also their fine structure is ensured. After recent discoveries, this appears only to be possible if Elysia possesses genes supporting photosynthesis. Those in can only have acquired by horizontal gene transfer from plant cells. This now is very uncommon, because even if there is often horizontal gene transfer between animal species, usually the new genes will not work in the new cells. Even more uncommon this is in a gene transfer between a plant and an animal. The corresponding gene has already been found in the meantime and is also inherited to the offspring. Those still need to acquire chloroplasts from plant cells, but at least they can maintain them in their own cells. New Scientist: "Solar Powered Sea Slug Harnesses Stolen Plant Genes"
Bill Rudman: "Solar Powered Slugs" on seaslugforum.net. Rumpho, M. E.; Worful, J. M.; Lee, J. et al. (2008): "Horizontal gene transfer of the algal nuclear gene psbO to the photosynthetic sea slug Elysia chlorotica". Proc. Natl. Acad. Sci. U.S.A. 105 (46): 17867–17871. (Link). Accessed: 24.11.2009.